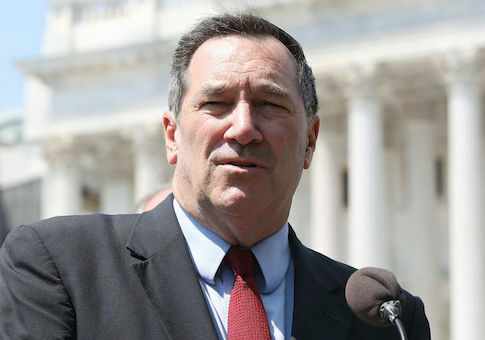 Joe Donnelly's latest campaign ad portrays him as a line of defense against "socialists" and "the radical left," but an analysis of voting records shows he's voted with Sen. Bernie Sanders (I., Vt.) 74 percent of the time since joining the U.S. Senate in 2013. Donnelly's ability to win reelection in November against Republican Mike Braun hinges on his ability to create distance with the growing far-left wing of his party. In his latest ad, "Peace Through Strength," he quotes Ronald Reagan and attacks the "socialists who want to turn health care over to the government." A voting comparison of Donnelly and Sanders shows, however, that Donnelly has voted with the de facto leader of the party's socialist wing 1,114 times since 2013, a 74 percent rate, according to data compiled by Congressional Quarterly. The most recent votes with Sanders include his vote against confirming Supreme Court Justice Brett Kavanaugh, against the Republican tax cut bill, and voting against the repeal of Obamacare. Donnelly's campaign did not respond to a request for comment on his record of aligning himself with Sanders. Donnelly's latest ad appears to be an attempt to push back against an ad from the Braun campaign highlighting his support in 2016 for Hillary Clinton, who lost Indiana by double digits. "Sorry senator, you're just not one of us, you're one of them," the ad says along with video of protesters. The Braun campaign has been focusing in the closing weeks on both Donnelly's record and his alliances to radical voices in the party such as senators Kirsten Gillibrand (N.Y.) and Elizabeth Warren (Mass. ), who both want to abolish ICE and have contributed thousands to Donnelly's reelection effort. The campaign is responding to Donnelly's latest ad by calling him a "liar" for his attempt to come out against liberal policies he's supported in the past. "Mexico Joe Donnelly is a liar: He stood with the radical left to smear Justice Kavanaugh, he supports socialized health care through Obamacare, his campaign is funded by Democrat senators who have vowed to abolish U.S. Immigration and Customs Enforcement (ICE) and stole Ronald Reagan’s ‘peace through strength’ motto despite supporting Barack Obama’s nuclear deal with Iran," said Braun spokesman Josh Kelly. "It's time we fire Mexico Joe and replace him with an American job creator Mike Braun who will always put Hoosiers first," Kelly said. Recent polling shows a neck-and-neck race between Donnelly and Braun. This entry was posted in Politics and tagged 2018 Election, Bernie Sanders, Joe Donnelly. Bookmark the permalink.